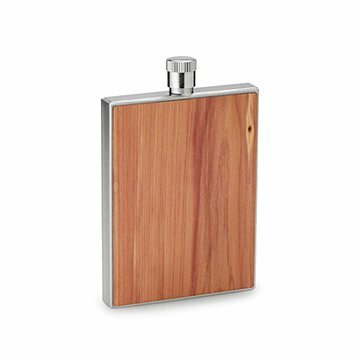 This handcrafted flask features a heady blend of rustic cedar wood and stainless steel. It's only natural that good taste in top-shelf liquor and modern style come together at last. Constructed by hand from sturdy stainless steel and sustainably sourced cedar wood, Jackson Bartlett's handsome flask features a heady blend of rustic and man made materials. After selecting only premium cuts of cedar wood, he laminates and hand-stains each piece to protect and seal the wood without compromising its beautiful, honey-hued grain. He then cuts the wood into thin slices and applies them to a perfectly portable stainless steel flask. Present this cedar flask to a whiskey-loving couple, raise a toast to your devoted groomsmen, or slip it in your backpocket to wet your whistle or share your good spirits. Handmade in Minneapolis, Minnesota. Each flask includes a certificate with the location of the tree that your purchase helped plant. Having grown up in the Northeast and New England areas of the United States, Jackson Bartlett was always close to nature. Whether it was traveling to the coast of Maine, or hunting with his father in upstate New York, he always found himself outside. This is what motivates him every day to come to work and perfect his craft of infusing goods used in daily life with the experience of nature. His motto in the shop is quality before quantity, and this comes through in his work. Use a damp cloth to wipe the flask clean.